Allow Appt. Center to Take Appts? This switch controls whether or not The ShowingTime Appointment Center is allowed to schedule showings on this listing. If an agent tries to use the Appointment Center to schedule a showing on this listing and this setting has been set to No, then the Appointment Center will refer all agents to schedule online. Note: Showing agents, inspectors, or appraisers, that subscribe to Appointment Center Plus may have the ability to schedule on your listing in certain circumstances. You will have the option to provide special details to our appointment center staff in these cases. Is this a listing agent accompanied showing? Note: Accompanied Showings is an optional feature. This setting may not appear on your Listing Worksheet. Accompanied Showings requires that an owner or occupant is added to the listing worksheet. Permission must be obtained from ALL designated listing contacts (Owner(s)/ Occupant(s)/ Listing Agent(s)) before the appointment request can be confirmed. Typically used for multi-dwelling listings or accompaniment situations. Appointment requests are documented and immediately confirmed. A phone call will be placed to designated listing contacts informing them of the confirmed appointment. Typically used with homes whose occupants are very flexible. Appointment requests are documented and immediately confirmed. No additional calls will be made. Typically used for vacant homes on lockbox. Appointment staff will log the details of the appointment request, inform the caller that the listing agent manages all showings for this listing, and provide the caller with the listing agent’s contact details. If possible, the ShowingTime appointment staff will attempt to transfer the caller to the listing agent directly. Typically used for listings with complex showing instructions. This switch controls whether or not the property is occupied or vacant. Information provided here is only used for Appointment Center staff and will not be provided to showing agents. Please notice the new sections for Agent Accompanied Showings. You can see that the contact sections are split into initial and final confirmations. Initial - Contacts in this area will be notified of the showing before the Final confirmation contacts. If the contacts in this section decline the appointment the Final confirmation contacts will not be notified of the showing request. Final - Contacts in this area will have the final say for appointments. They will be able to decline an appointment even after the initial contacts have approved it. This section allows you to configure any contacts method of notification when appointments are scheduled. 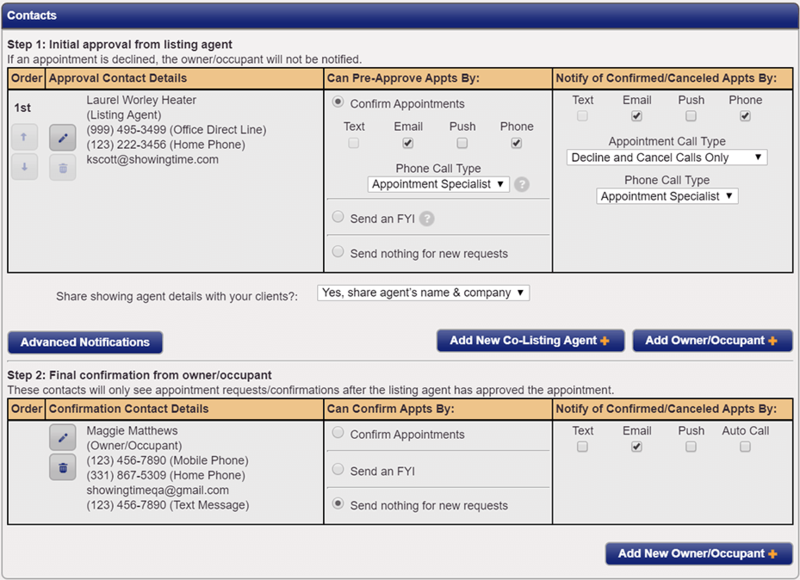 Options are dependent on the appointment type selected. This allows you to configure contact notifications for which the contact needs to be part of the confirmation process. Allows you to configure the contact to not receive any form of notification when appointments are requested. These switches control whether or not you would like the Appointment Center to handle Inspections, Walk-Throughs, or Appraisals. If either of these switches has been set to No then anyone trying to schedule that type of appointment will be referred to contact the listing agent associated to the listing. Suggested is a lead time which will allow appointments to be scheduled, agents scheduling will be notified that the owner or occupant prefers the time set but it will not inhibit appointments from being requested if the requested time falls within that lead time. Access details can be verified when confirming an appointment. Different access types may also require location or other information when selected. 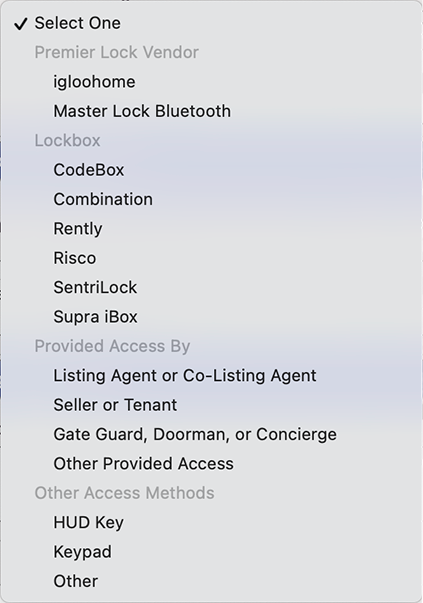 This option should be turned to Yes if keys for the building are not located at the listing itself and are located at the listing office or a remote location. Agents who have scheduled appointments through the Appointment Center will have a key reserved when scheduling if a key is available. Alarm Information will only be provided to agents when an appointment has been confirmed. For Security Reasons: If an agent calls the Appointment Center in regards to an alarm that is going off, ShowingTime will not provide any alarm details to the agent unless they have a confirmed appointment in the system. If the status of their appointment is canceled, declined, requested or they don't have a scheduled appointment logged in the ShowingTime system then they will be referred directly to the listing agent. Any notes that are staff specific. Information entered in this field is not necessarily required for the CSR to convey to the agent, and will only be conveyed if they have determined it applies. If conveying a note to the showing agent is required, it should be added to "Notes for Showing Agent" section. Any notes that you would like provided to the showing agent "after" the appointment has been confirmed. First, choose the date for when you would like the note to expire. Temporary Notes added will override any previously added notes. If existing notes are still needed, then select the Paste these notes into the Temporary Notes button.